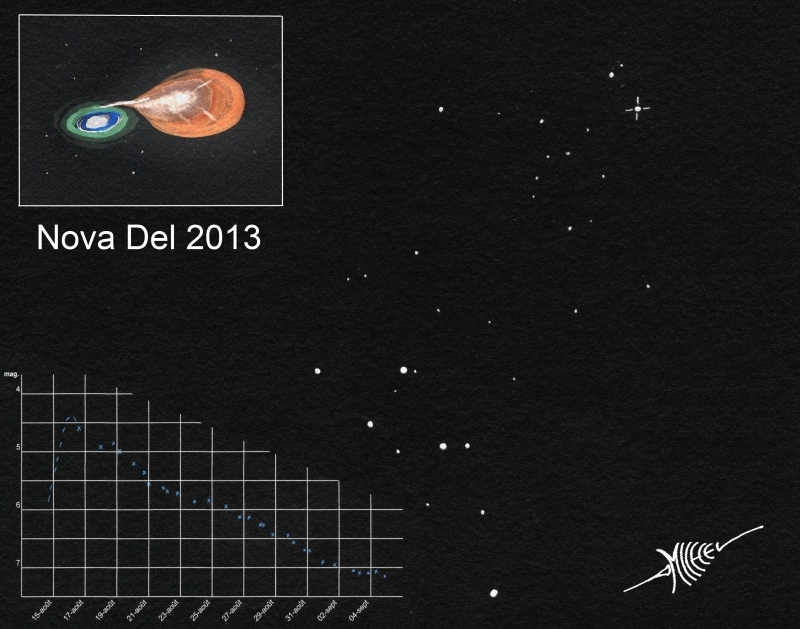 I like things moving in the sky, and the Nova Del 2013 was the kind of progression that I like to chase. A little bit less artistic, you can find the curve made of 30 magnitude estimations I did during 20 successive nights, no one single cloudy night! The original sketch was done during the first night (Aug. 15th) the Dolphin constellation is easily visible. The observation was made via 10×50 binoculars and then with a 80/400 refractor, received from my friend Yvan, to follow this observation . The sketch of the nova story, on the upper let corner, was made with inverted watercolour. Hope you like, it’s difficult to make an artistic curve, isn’t it? What amazing job you presented here! Wonderful sketching and information tabulation. Outstanding presentation of your sketch and observations. And I’m envious of your clear weather. Thank you to you all !